Jesus went there accompanied by his disciples, and when the Sabbath came, he began to teach in the synagogue. Many who heard him were amazed. “Where did this man get these things?” they asked. “What’s this wisdom that has been given him, that he even does miracles!” “Isn’t this the carpenter?” “Isn’t this Mary’s son and the brother of James, Joseph, Judas and Simon?” “Aren’t his sisters here with us?” And they took offense at him. They brought Jesus to the place called Golgotha (which means The Place of the Skull). Then they offered him wine mixed with myrrh, but he did not take it. And they crucified him. Dividing up his clothes, they cast lots to see what each would get. 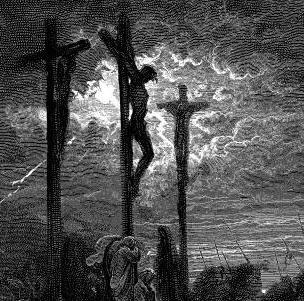 It was the third hour when they crucified him. The written notice of the charge against him read: THE KING OF THE JEWS. They crucified two robbers with him, one on his right and one on his left. Jesus rose from death and promised forgiveness of sins and eternal life to all who repent.